Amos Lee James, age 87 of Marion, OH, passed away on Monday, July 16, 2018 at the Heartland of Marion. Lee entered into this world on October 15, 1930 in Inez, KY to the late Herbert and Betsy (Fannin) James. 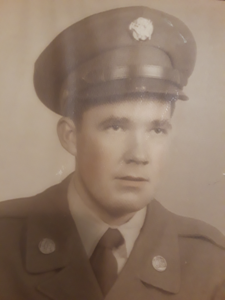 Lee served our country in the United States Army during the Korean Conflict. He retired from the Conrail Railroad after many years of service. He will truly be missed by his family and friends. Lee was preceded in death by his parents, a sister: Flora Williamson and a brother: Zephinar James. Lee will be missed by his son: Rick Bowen of Marion, OH; his daughter: Barbara Pinnick of Satelite Beach, FL; a brother: Edgar James of Inez, KY and a sister: Anna Bowen of Marion, OH; his grandchildren: Joshua, Chad and Kristin Pinnick; his four great grandchildren; and nieces and nephews. Friends and Family may come to honor Lee’s life on Wednesday July 18, 2018 starting at 4pm to 8pm at the Crum Funeral Home. A funeral service will be held on Thursday July 19, 2018 at the funeral home starting at 2pm. Burial will follow the service at the Williamson Cemetery. In lieu of flowers, donations may be made to Heartland Hospice of Marion, Ohio. Arrangements are under the direction of Crum Funeral Home of Inez, KY.